The second grade sweet spot. I’m one of the lucky ones who gets to say “I teach 2nd!” and if you’re like me, you’re thankful for the work the kindergarten and first grade teachers put in, before the kids get to us! (I am extra appreciative of the work K teachers do, because I “lived” there for 4 years…) This is especially true when it comes to science and the NGSS standards! Your second grade science standards are going to be a whole lot of fun! There are always great ways to present hands on science experiments and activities in the classroom. SECOND GRADE SCIENCE STUDENTS ARE OLD PROS! Once the students come to us, they should be familiar with many of the core NGSS concepts that we will continue to build on during our time together in second grade. They should have had opportunities to experiment, get hands-on with their learning and test out some ideas through their STEAM work in K and 1. They should also be familiar to some extent with the STEAM design process. All of this schema make it really easy for us to kick off science early on in the year, and keep the train rolling throughout! 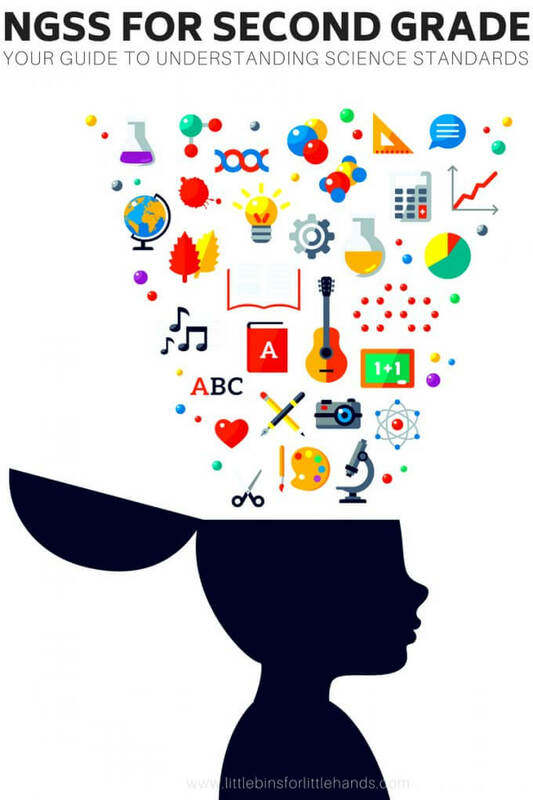 The standards for the second grade year will again sound similar to those of the earlier grades, in some cases, but will also allow us the opportunity to continue to dive deeper into the concepts and the amount of information we share regarding each topic. Your first bundle of standards for second grade is all about “matter and its interactions”. In this unit, you will have our students investigate a variety of materials in a number of ways. The students will be thinking about texture, hardness, color, strength, flexibility and absorbency, etc. in relation to different items, focusing heavily on physical characteristics of matter. (Of course slime making is a fun way to explore matter and physical properties). They will also be testing out their design skills, which they should have honed some in Kindergarten and first grade, independently for the first time. You can have them plan and conduct experiments, in order to classify and describe the different materials they are working with. The purpose of these experiments will be to determine the best materials for specific intended purposes. For example, you may decide that your school or classroom needs a material that can clean up liquid messes, but be reused many times in order to save money and be eco-friendly. When you present this to your students, they will have to think about absorbency and strength as well as wash-ability in order to solve this problem. Students will also be exploring materials to determine what kind of objects are made of other small pieces that can be taken apart and put back together in other ways to make new objects. These could be items like blocks or LEGO. The final standard covered in this unit involves experimenting with heating or cooling, and how some physical changes to materials can be reversed and some cannot. A fun and hands-on way to test this out is with chocolate chips! Who doesn’t love an experiment that is edible at the end?!?! First you can have the students can observe and discuss chocolate chips straight out of the package from the store. You can give each student a snack sized Ziploc bag and drop a few chips in. Discuss the chips as solids and the properties they have, (breakable, firm, etc.). Next, using body heat, have the students warm the chips in their bags between their hands (careful not to squeeze too hard, or the bags will pop and it will get messy – trust me, I’ve learned this one the hard way.) and turn them into a “liquid”. Then discuss the liquid chocolate and its properties again! Finally, you can throw the baggies into the fridge or freezer for 5 minutes, and then observe again! Now the chocolate should be solid again, demonstrating a reversible change in the matter from solid, to liquid and back again! If you’re feeling really brave, let the kids eat their chocolate and discuss what form of matter the chocolate takes in their mouths and how the properties change yet again! What a sweet way to wrap up the first unit! The second unit for second grade is all about a surface level exploration of ecosystems. In this bundle of standards, we will be asking our students to again get hands-on with their learning as they plan and test their ideas surrounding these concepts. We will also be building off of the first grade unit about molecules and organisms. While we studied plant parts in 1st grade, we will now be thinking about plants in a different way. Before we explored how certain physical features helped plants grow and survive, now we will test to see if plants need sunlight and water to grow. The students will decide how to test their hypothesis and record all of the data surrounding their experiments. Students will also explore how animals help plants and their ecosystems by moving seeds from place to place and aiding in pollination in this unit. We want students to realize the interdependence of plants and animals, and have them think about how a plant cannot uproot itself to meet its needs, so it relies on animals to help with pollination. TURN LEARNING SCIENCE STANDARDS INTO A GAME! A way to make this more concrete for the children, is to turn it into a game that will get your students moving and learning! Playing “pollination tag” outdoors can get even your most reluctant or struggling learners involved and meet the standards in an engaging way. Students will draw a flower on a paper and stick a pom pom or cotton ball to the center. Then two or three students will be the pollinators. The flowers and pollinators will all run around and essentially play tag, with the pollinators being “it”. When a pollinator tags a flower, the flowers will give the pollinators their pom pom or cotton ball and the flower will freeze. The pollinator will then continue to tag flowers, in hopes of collecting pollen and then finding one without “pollen”. When that happens, the pollinator will give the flower a cotton ball that they had previously collected and the flower will sit down! The game will continue until all or most of the flowers have been pollinated! It’s a simple game based on one that the students will be familiar with, but that also drives the point home in a concrete and kinesthetic way. Watch the students play this game on their own at recess days later too and rest assured that they “get it” and have met these unit 2 standards when that happens! Plants and animals will follow us into the next unit of standards for second grade, as we support our students through the exploration of “Biological Evolution: Unity and Diversity”. You will help your students to observe and compare the differences between habitats and the plants and animals living there! LEARNING THESE SCIENCE STANDARDS STARTS OUTSIDE! First explore and discuss the plants and animals right where you live. Get outside, take pictures, get a little dirty! This will make it real for your students. Then expand and discuss other familiar habitats, like the desert, arctic and the rainforest. Use National Geographic Kids to view videos and high quality photos of the different habitats. Chart and compare the plants and animals from each biome and discuss why different living things live in different places. TRY IT: You can have your students select a specific animal from each habitat, research it and create a diorama or poster about the animal, where it lives and the student’s new learnings about this animal! (This is what I do, and then we create a zoo in our room for the school to visit!) This is a short unit that can be expanded on as you choose! Go as big or as small as you want with this one! You will touch back on the first grade unit about “Earth’s Place in the Universe” and build upon it in true NGSS fashion! Another “mini-unit” if you will, this “bundle” of standards consists of only one concept! In this unit, you will need to guide our students through the collection of evidence from several sources to help them learn and understand different “earth events” that happen both quickly and slowly. This is your “natural disasters” unit if you will, (which I hope for your sake will feel less like a disaster and more like a success!). Students will love learning about volcanoes, earthquakes and erosion through books, videos and even some simple hands-on experiments. After learning about erosion in unit 4, we will now ask our students to brainstorm solutions to it in unit 5. Students will explore and create solutions for slowing or preventing wind or water damage to the land. They will need to come up with ways to keep water back and wind away in order to preserve the land. The kids should explore this with both man made materials (like concrete and metal walls for example) and natural materials (like stones, plants and trees). This can be done with dirt or sand and tubs of water or a fan right in your classroom! You will also teach our students about landforms in this unit, and tie their formations to wind or water. Bodies of water will be another focus, and if you’re lucky, you’ll have one or more in your community to discuss. Remember your students are still young and in the egocentric phase of development. This is important and will serve as a reminder to focus your study of landforms and bodies of water to ones they will have schema about! Make sure you connect matter into this unit too, so students can be amazed how gasses and liquids have shaped their world and the solids around them! The final piece of this unit will also tap into your previous knowledge of solids, liquids and gasses as you help your second graders to gather more information about where water is found on Earth and where that water is in solid form vs liquid form! The final set of standards that NGSS has laid out for second grade is our first explicit “Engineering Design” unit. 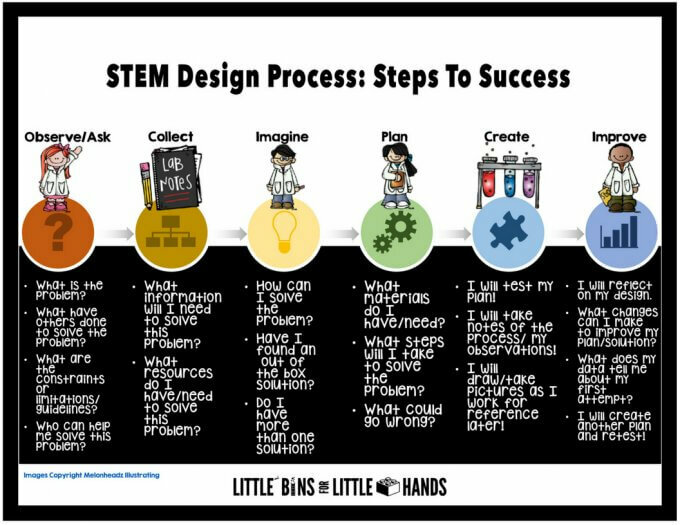 This is where all of those STEAM/STEM experiments will come into play and where we can teach our students about the STEAM Design Process. Check out the FREE download resource pack at the bottom of this page. Then you will have your students try another solution based on their first experiment and analyze the data from the two trials! It is my advice, that you actually kick your year off with this unit, as it engages students in hands-on work immediately, and will benefit the work you need to do to meet the standards in the subsequent units for the remainder of the year! Whatever experiment or challenge you choose, make sure the questioning, analysis and attempts remain the important focus. This is where the students will learn about the process that scientists, technology experts, engineers, artists, and mathematicians use daily in their professions. It’s clear that you are going to ask of our second graders more than ever, but you can still find ways to keep the NGSS standards and subsequent learning hands-on and fun! Don’t get bogged down with the weightiness of some of the bundles, and when in doubt keep it simple! 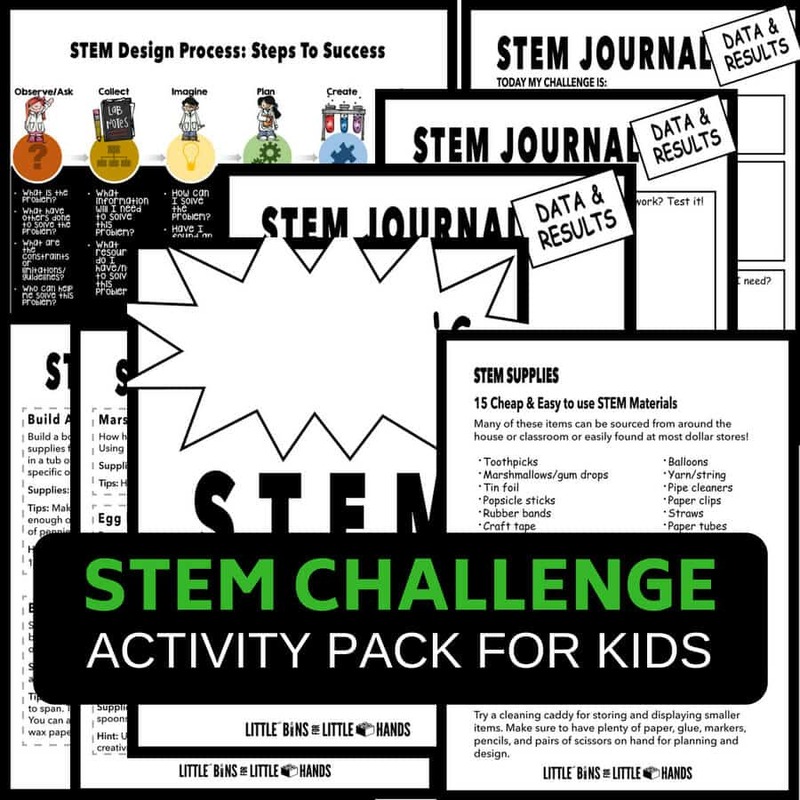 For a handful of STEM activities for this unit and beyond, click here to find your FREE printable STEM pack and more information!